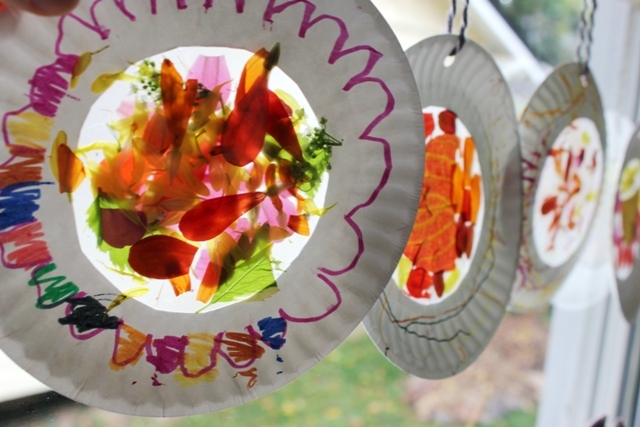 Here are a collection of fun toddler activities, crafts, and books related to autumn. I shook that tree just as hard as I could. and mmm they were good. Play-dough: There are LOTS of recipes for Play-dough available online. Here’s one I like: Mix 1 1/2 cups water and 1/2 cup salt. Heat to almost boiling. Remove from the heat and add 2 TBS. vegetable oil, 2 TBS alum*, food coloring. Cool & knead in 2 – 3 cups of flour. * You can find alum in the spices section of the grocery store. Or you can substitute cream of tartar. Felt Tree: Cut a tree, leaves & apples from felt. Let your child stick them to a felt board. Leaf Hunt. Go for a walk and collect fall leaves. Talk about the different colors and the different shapes, count how many points they have, compare small to large, and notice smooth edges versus serrated edges. Point out which tree each leaf fell from. Pumpkins and golf tees: Get a pumpkin, golf tees, and a toy hammer. Kids ages 3 and up can hammer the tees into the pumpkin. For toddlers, you can hammer several golf tees in – they can take the tees out and put them back in – great small motor practice! Pumpkin finger puppets. Make finger puppets to go with the five little pumpkins rhyme. You could make them with playdough or felt or mini post-it-notes stuck to your fingers. Owl Babies by Martin Waddell. One of our favorites!! A sweet story about three baby owls who worry when mama goes hunting. But of course mama comes back! Five Little Pumpkins by Dan Yaccarino. An illustrated edition of the finger rhyme above. Apples and Pumpkins by Anne Rockwell. Simple book that features fall themes like apple picking, jack-o-lantern carving, and trick or treat. Apple Farmer Annie by Monica Wellington. For kids 4 and up. Talks about apple picking, counting, sorting, baking, and selling at a farmer’s market. The Very Busy Spider by Eric Carle. Lots of farm animal noises & repetitive lines for kids to join in on. Printable handout of these fall activities here. For my full collection of theme-based “Fun with Toddlers”, click on “Fun with Toddlers series” in the right hand side bar. Or if you would like them in printable handout form to share with students, click here. This entry was posted in Fun with Toddlers series, Play and Fun Activities and tagged autumn, Books and Resources, fall, preschool, songs, toddler on October 26, 2014 by Janelle Durham.